Joseph Stalin had only one real job before going into revolution as an occupation. He was a weatherman. He also had smallpox. And a webbed foot. And one arm shorter than the other because of an accident with a horse. His dad was an alcoholic, a peasant. As a psychology guy I find these seemingly random facts incredibly interesting. There is no way to be certain but it may have made a difference that the defender of the largest geographic region in the world during the nazi attack called Barbarossa was intimately familiar with geography and weather. The nazis were ultimately stymied by the cossack winter. Was that a coincidence? What impact did his pockmarked face have on his bad attitude? What was it like growing up as a Georgian peasant at the end of the 19th Century Russia? Did growing up in poverty influence his decisions? How was he moulded? Chances are, you can’t really escape your past. I look like my father, I have his hands. My kids are just better looking versions of me, poor slobs. There are scars, outside and some deep down. You have been imprinted by your past, by your culture, biology, and family systems. Hitler attacked late. In the famous account we now know that at the last moment he decided to detour over to Hungary and flex his muscles a little. As a Canadian I can appreciate how short summer can be. The timelines were incredibly tight. Hitler had to have Moscow by winter. He was a few weeks late. The German soldiers had not come prepared for the Russian winter. Timing is everything when it comes to the weather. A weatherman would know that. We may never fully understand the influence of seemingly insignificant detours in our lives. You chose one school or another and it changed everything. You met one person who transformed your future. You were born to particular people with specific dysfunction. You learned certain coping mechanisms in certain ways from certain people. The person I have become has been no accident, in spite of it happening by accident. We all carry the impressions from our little piece of crazy. One of the reasons that this stuff takes so long to master must be because we have spent a lifetime being imprinted by our surroundings. The jury may occasionally be out, with regard to the biological impact that your forebearers have had on you, but one thing is certain – nurture may have more to do with your life than nature. There are specific and significant mechanisms that interact when you live in an environment such as yours. There are entire branches of psychology dedicated solely to this, family and cultural systems theory and therapy. It is impossible to understate the impact living in such dysfunction could have upon a vulnerable and developing psyche. You are what you eat. And who you love. And where you live. And how you are hurt. Chances are there are also a bunch of other influences, whether apparent or not. I am a Williams. That probably means nothing to you, but my family has created a mythos around our heritage that is taught to subsequent generations. This Christmas my parents bought everyone around me a T-shirt with “Be calm and let Williams handle it”, even the still-to-be-born Williams affectionately referred to as “Jellybean” (he/she received a onesie). If you are a little child in my world whose name ends with Williams you have undoubtedly been reminded how awesome and lucky you are; just because you are a member of this elite and ofttimes condescending tribe. 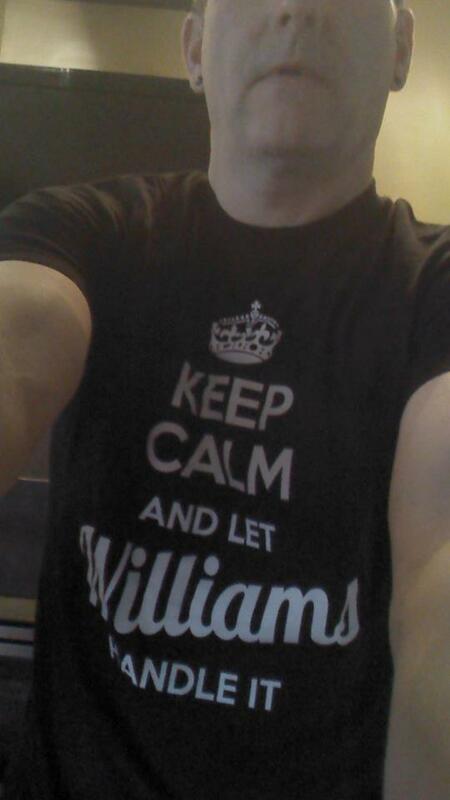 My kids think that to be a Williams is a big deal. Generations of winners. It’s all a lie. I mentioned recently that my family were/are peasants. Our history floats on a river of alcohol and impulse-control problems. My dad is an orphan. My mom, as a child, probably never met a teetotaller. I come from hard stock, unforgiving and obstinate… and talkative. Many had very large noses. Serfs. This history touches my life every day. I have acquaintances who are one or two generations further removed from their peasant ancestors. That fact alone has a massive impact on every aspect of my life. There is not, and never were, the merchant assets to pass down to the next generation. This led, inevitably, to fewer options and a far greater likelihood of generational poverty. Williams’s don’t go to college, or at least they didn’t. There was no tradition nor cultural expectation with regard to education. My family simply did not go to college, we went to war. I am honoured to report that my father, at 76, is in university… again. I received my high school diploma before he did. These are not insignificant cultural markers. How you grew up, and who you grew up with, affects everything from finances to self-esteem, where and how you live, who you date, how you raise your kids, how you self-medicate, how often you travel, your values and spirituality and intelligence and ability to cope. Further exposure to experience or abuse melds the psyche in early childhood, and sometimes much later. If your parents broke up, this will impact your everything. If you were/are abused, if you make poor relational choices (for the aforementioned reasons), if you grew up around violence or addiction or a passive-aggressive parent or three-ply toilet paper, everything factors in. A man who earned his living by predicting tomorrow’s weather probably did not get confused when the snow started to fly in early October. His troops were cold weather fighters who used the land and the cold (and the biggest secret peasant army hidden east of the Urals that the world has ever known) to defeat the undefatigable Third Reich. Stalin knew hardship. The Nazis were almost in Moscow and all seemed lost, but Stalin did not leave – why? He was depressed but he was a Georgian peasant who had risen to the top by killing every single person (and their family) who stood in his way. The boy who had been teased for his scars and his bum arm wasn’t laying down for anyone. Some people have wounds that have defined them, shaped them. Who I am, and where I come from, is so fundamentally important that it’s almost embarrassing to discuss. Yet time and again we are resurprised by our foibles and cannot understand why we act the way we do. We date the same kind of person over and over. We continue to experience the same difficulty with relationships, or finishing projects, or hoarding, or painting the kitchen every other month. For some, anger has become our constant companion. Others have identified themselves as broken for so long it is impossible to imagine a world wherein wholeness is even an option. Understanding the role our history has played in our dysfunction is crucial to healing. As the man said, those who cannot remember the past are condemned to repeat it. This oft-quoted line has been liberally applied, but I believe it can apply here. There is a possibility that you may not be as nuts as you think you are. Perhaps it really is your parents fault! Whatever the truth, it’s important to find out. Learning is how we wrestle this pig to the ground. Again. When I was 29, I woke up one morning and realized that I had been having a repeating nightmare. I could remember it being a little different, years ago, but wasn’t sure how. In the dream I was always chased by two guys who grabbed me and threw me into a white van. I believe the van was once brown but it changed colour, I have no idea why. That day it dawned on me that I had been having a version of this dream since childhood. I decided to look a little deeper. Over a period of time I was able to trace the dream back to when I was 9 or 10 years old. So the question was, why? I am old enough that I believe that I saw Pinocchio, probably on a Sunday night, and probably while watching The Wonderful World Of Disney. I remembered how frightened I had been when the slimy Fox and the Cat (or whatever they were I’m too lazy to Wikipedia it) grabbed Pinocchio and threw him into the cart with the donkey boys. Could it be? I never had the dream again. It could be that, once I realized why I was having this nightmare my subconscious was able to move on. It might be that I’m more brain damaged than I think. Either way, I’m all good. I know it sounds like I am suggesting that if you can trace back your abuse to a specific time then you would miraculously “get over it”. If you’ve been here before you know that’s not my thing. This story is an anomaly. I find it interesting, however, because of the power of such narratives. There is a connection between our thoughts, motives, history, and mental health. Quitting cocaine is a great step but chances are that isn’t your complete problem. Your life is your problem. There seems to be a real correlation between how much I know about this stuff and how fast I move forward. The more I learn, the faster I run. I’m as nuts as I think I am.